Two men and a teenager have been jailed today at Wood Green Crown Court for a total of more than 30 years for carrying out 19 knife and acid attack robberies in north and east London.The horrific attacks targeted taxi drivers and people selling items via Gumtree. 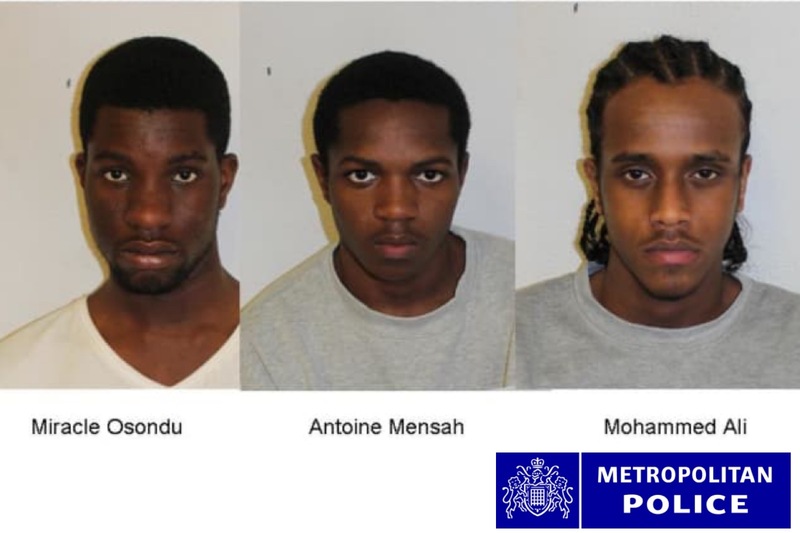 The group used strong acids, alkalis, and knives, to rob and maim their victims, some of whom will never recover from their injuries.Antoine Mensah, 21, was sentenced to 13 years, extended to 17 years, in prison after pleading guilty to a conspiracy to rob comprising 19 counts of robbery as well as a planned robbery, possession of an offensive weapon and possession of a bladed article. Mensah also pleaded guilty to six counts of assault in an unrelated case. Mensah will serve a minimum of 8 years and 8 months in prison.Miracle Osondu, 19, was sentenced to 11 years, extended to 15, in prison after pleading guilty to a conspiracy to rob comprising 19 counts of robbery as well as a planned robbery, possession of an offensive weapon and possession of a bladed article. A separate charge of theft from 2017 will remain on file. Osondu will serve a minimum of seven years and four months in prison.Reporting restrictions were lifted on the teenager involved at the instruction of the judge. He is Mohammed Ali, 17, was sentenced to eight years, extended to 12 years, in prison after pleading guilty to a conspiracy to rob comprising 19 counts of robbery as well as a planned robbery, possession of an offensive weapon and possession of a bladed article. Ali will serve a minimum of five years and four months in prison.